We have a 17 Metre medium standard Tumble Run along with a 12 Metre Air Track. We have also recently purchased 2 'Comfort' Landing Mats, which are high quality variable density mats ideal for safe development of somersaults. With the aide of these mats our Gymnasts are now working on double back somersaults. At the moment this is an 'Invitation Only' squad, which gymnasts are offered as an 'add on' to other classes and is dependant on their skill level. 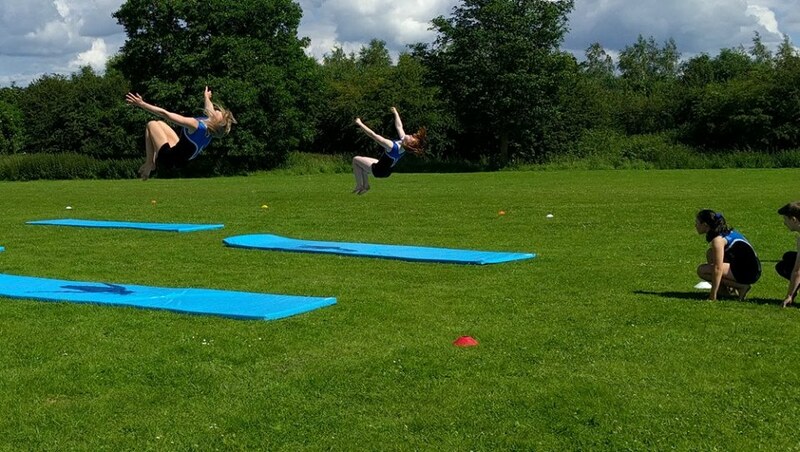 Gymnasts continue to work on the basic tumble elements of rolls, cartwheels and round offs in their present class and when ready they are able to use a 'Tumbler' training block to gain experience at back flics. This allows us to concentrate on the more advanced moves should they gain a place in the tumble squad.